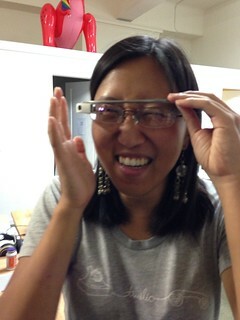 So I got a chance to explore Google Glass tonight. Setup took two tries, apparently it doesn’t work on 5G wifi (Kalvin found via Google search) and then we all delighted in flailing around with swipe and tap gestures to figure out how to use the thing. I took a photo of Judy trying to get it to play a video… not quite the streamlined experience we’ve been led to expect, but that’s ok. We’re explorers. It’s fun. She made this first person chinese ribbons video and I recorded this video of the same chinese ribbons from a 3rd person perspective. Then I shared them to Google+, sadly I can embed them in my blog. Then I accidentally started a hangout with EVERYONE in all of my google circles. Luckily I don’t really use Google+ that much, so I *only* invited 82 people to my hangout! Most of my friends and acquaintances were fairly entertained. Then I shared them to Google+, sadly I can embed them in my blog. Someone isn’t keeping your blog updated!